The Walmart in Palatine does NOT have any posting like this, I looked for one at lunch time... But I got to wondering, let's say they did post a sign... I frequently sneak in the back door by the auto service area. If they don't post a sign at that door, are you good to go as long as you enter through that door? I am in Southern Illinois... So my Walmarts are not posting (yet). I am not familiar with the Walmarts up north. I would be more than happy to call if I had the addresses of the stores in question and a photo of the sign at each location. Edited by III, 08 January 2014 - 04:44 PM. I personally saw these signs posted today at the walmart in Geneseo, IL. I thought about taking a picture and posting on here, but forgot to o it on my way out. Definitely a confusing sign, and I think that if they expect to have an issue with this, then they need to make an announcement to their employees and vendors off-line, not post it on the front door. If they keep this up, I will stop shopping at any Wal-Mart. Geneseo is just to the East Of the Quad Cities where I do plenty of shopping...not liking this at all. At the risk of stating the obvious, it appears this is a coordinated move by Chicago area Wal-Marts and not just a couple overzealous managers at individual stores. While it technically doesn't affect non-employees and non-vendors, I still don't like it. Geneseo has it, and I highly doubt they are coordinating with the antis from chicago. Saw it posted today at Rochelle Walmart. Out of curiosity.... Are you seeing similar signs being posted at your area Targets where you are seeing these signs at Walmart? Havnt been to any of those lately. But I'll be on the look out when i go next. They could have achieved the same thing by issuing a modification/clarification due to new legislation to their vendor agreements and modifying their employee handbook. We believe in maintaining a working environment free of violence or threats of violence. This means inappropriate language, gestures, threats of violence, and physical violence will not be tolerated. This kind of behavior creates hostile working conditions, and violates the first of the 3 Basic Beliefs: respect for the individual. Edited by Tango7, 08 January 2014 - 06:15 PM. I think some of you guys are over reacting on this. I for one appreciate that this sign only applies to employees and vendors. The question of the sign not being legal isn't valid because it speaks of company policy for their employees. It states on duty employees and vendors, so I'm assuming employees off the clock are good. I'm not surprised they are banning carry for employees, they already have a policy banning them from physically detaining anyone shop lifting and they probably don't want their employees walking the isles with a firearm and risk offending those who don't like guns. They are posted on the front doors because many of the vendors come in the front. I think we should all thank walmart for supporting our right to carry in their stores. If we make a bunch of waves about it then they might just ban everyone. Maybe. But you can see how much confusion this is causing. It would not hurt asking corporate for a clarification. I don't suspect we will have any miscommunication south of I-80...But I do suspect that there could be an issue with some "anti" calling the cops on someone as soon as they see something poking out from clothing. All this sign is is litigation waiting to come crashing down on some poor guy (or gal) that can't afford their day in court... Just so the "anti" crowd can further their misguided narrative. Maybe it only applies to employees and vendors, but the legal stature posted at the bottom may create a situation for somebody to get pinched. who knows for sure at this stage of the game if it is legally binding due to the stature, or not. May take a court case to straighten out. the other thing is why is IL the only state that has the sign on the door. I guess they can do whatever they want even if they have a sign, they still can choose to have you arrested or not. If they post legal signage, it's a prohibited area and violators are subject to arrest and prosecution, it's not at the discretion of the store at that point. Their discretion is whether to post the sign and make it a prohibited area (if not prohibited by statute). Illinois doesn't make it trespassing, it's a criminal offense. If they post signage that doesn't meet the legal definition it's hard to say exactly what would happen. You could easily end up as the test case in front of a judge as to whether signage besides the specified sign is legally binding. Ya that doesn't bother me personally, but you are correct, better safe than sorry. If you conceal correctly how would anyone even know though to call the police ? Again I agree with respecting all laws and gun free areas. Edited by mic6010, 08 January 2014 - 07:40 PM. You guys are making me paranoid. Guess my Wally Walk will be in NWI instead of Illinois. It really wouldn't surprise me if Cook County Walmart's end up with total ban on CC just like they don't sell ammo. I find the sign a little confusing especially with the text at the bottom. I just got back from the Huntley Walmart. I spoke with the assistant manager and explained my concerns. He told me that he'd bring it up with the head manager tomorrow. I will follow up in a day or so with her. My wife saw one at a Walmart in Peoria today. It looked like an 8.5*11" sheet of copy paper with the ISP graphic. 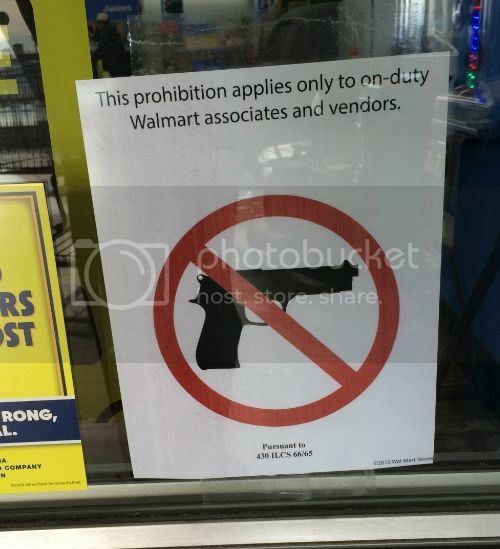 There was additional text that said employees and vendors are prohibited from having "weapons". By using the ISP graphic, are they unintentionally prohibiting customers from carrying? Edited by bobapunk, 08 January 2014 - 08:41 PM. ^^^^ That's a very good question. I'm not shopping there unless they take down the signs. I still don't see this as an issue. After a while, this will all blow over. Once everyone is familiar with the rules and policies of Walmart, the signs will probably come down anyway. Anyone who has a concealed carry permit should know the law and that businesses must display the official 4x6 graphic available from the state police for it to be legit for the general carrying public. I could tell from across the parking lot that this was larger than 4x6 and had additional writing on it. I see no need to raise a stink with a company that is supporting of our rights. I think our efforts would be better served complaining to businesses that are against it and making our opinion known. IANAL, but if they post the exact specified legal sign, it's a prohibited area. They can't post the legal sign and then try to qualify it with additional text or signs. The problem is that the ISP rules that have been discussed indicate that as long as their "approved" sign is shown in a minimum size of 4x6, the store can add ANYTHING else they want and it still is a legally binding sign. The signs which have been shown in this thread meet those rules.... Thus why we are confused. If it's a modified sign and has to do with company policy and not the law, they can do whatever they want. It's not a legal sign for us, so it can be ignored. The writing they added makes their intentions clear. It has nothing to do with us. I won't be the one who risks going in there and having some "anti" call the cops because they were scared (if I happen to print). The only confidence I would have in court is that there would not be anyone from Walmart there to explain their intent on the sign. If you're so concerned about it, why not just ask a member of management to clarify their policy? I think it's perfectly clear but that's me. This is simply part of the price we pay being the first ones to carry in this state. It's understandable to be a little timid about it. I gotta admit, I'll probably feel like I'm doing something wrong the first time I carry in public. If the signs are confusing, I think we all need to be very respectful about how we handle this. We start causing lots of problems, then we are just gonna confirm people's fears. I spend a lot of time at our local walmart and fully intend to enjoy their respecting of my rights. We start running around throwing a fit about a sign that they intend to inform employees and vendors, then the anti gunnies might get what they want when they get tired of the griping and just ban it all together. My issue (or concern) is that this state has made it a criminal act if we are caught in a prohibited space (I am specifically referring to a private business with a sign). I don't have to worry as much about this in the other states I carry in because it is not a criminal act. If I forget to disarm or I don't notice a sign and someone notices, I am at least afforded the courtesy of being asked to leave before the cops are brought into the situation. Further more, once you start to carry often, you will begin to realize just how comfortable you become with your firearm... To the point that you don't even notice it is there. It just becomes a part of you... Much like that trusty knife that is clipped to the inside of your pocket. Edited by III, 08 January 2014 - 09:13 PM. So if the police are called by the off chance that someone noticed you're carrying and doesn't assume you're an off duty cop then I'm certain the police will talk to management. Unless you think management will throw you under the bus by taking the modified signs down and replacing them with legal signs before the police arrive and then lying to the cops about their policy so they can send one of their customers to the slammer. Unless you're public enemy number one, you should be fine. If you're concerned this much, then you could always simply not carry in there. I'm not concerned at all but that's me. If they didn't support us carrying in there, then they would have just put up the normal sign. My concern is the fine print at the bottom at the bottom of that sign. Walmart has policies of respecting the individual and their general company policy is supporting whatever the state laws are in this matter. I would imagine this may be up to the specific store manager's discretion and they may be able to ban in their store if they feel the need. The signs are probably to make sure everyone is informed as this is brand new here. And I won't be carrying in there with that sign. My interpretation of the ISP rules is that sign is legal regardless of the language they have above it. Which is why I would prefer corporate clarify this issue. I am sure their intention is well. Unfortunately, I believe that their execution of said intent is causing unnecessary confusion, as well as, placing their customers at risk of a misdemeanor. No manager can override corporate policy. The should have hung up a sign without the fcca language at the bottom if they are so concerned about employee ccw. The way I see it they are breaking corporate policy and it needs to be brought to corporate's attention. Edited by mata777, 08 January 2014 - 09:37 PM. Totally understandable. I'm merely suggesting that we all be very professional about this. I don't like some of the attitudes I'm seeing on this thread and I certainly don't want those attitudes to speak for me. This is meant to be a positive experience for this state and the more professional we are, the more likely the other restrictions we have will loosen up in the coming years. The concept is to win concealed carry, which we did, then to begin to expand our rights. It will be much easier if we don't have people running around telling everyone they won't shop there until the signs, that don't ban carrying by the public, come down. Let's keep in mind that many of the people we deal with won't even know the laws. I've talked to a couple of businesses about this and they didn't even know what the concealed carry was.